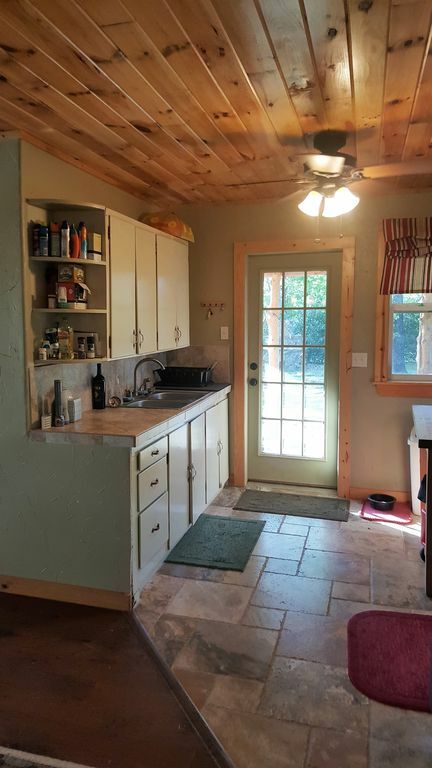 Enjoy a Romantic Getaway at the Cottage on Lake Texoma – Trina Kay Co. The Cottage is the perfect setting for creating lasting memories. Nestled in trees and nature, overlooking the sailboats at Grandpappy Point marina on Lake Texoma. Enjoy sunsets on the large covered deck with wrap around seating for a crowd or enjoy a relaxing place to have dinner and a movie with the outdoor grill and big screen TV. Six can sleep comfortably in two nicely decorated bedrooms with ample space in the great room for extra airbeds or sleeping bags, and the grounds are large enough to pitch a few tents. The large sectional sofa is so comfortable you won’t want to leave, but there is plenty to do in the area. Your vacation is waiting. 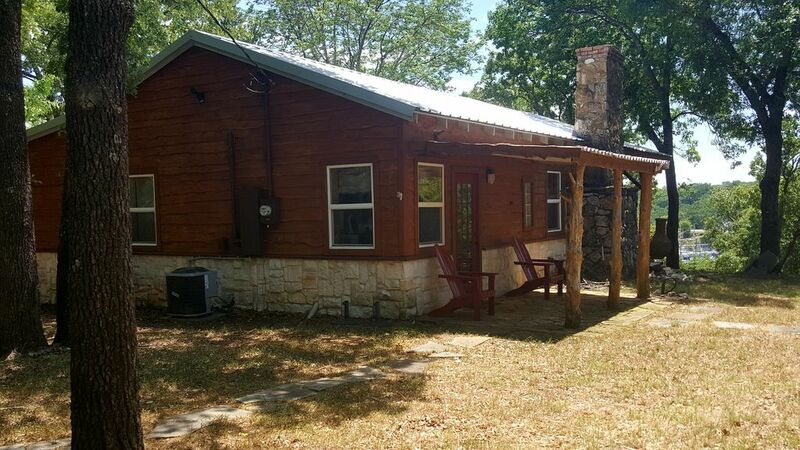 We are centrally located – just an hour away from Dallas or 1 ½ hours from Oklahoma City on Lake Texoma. 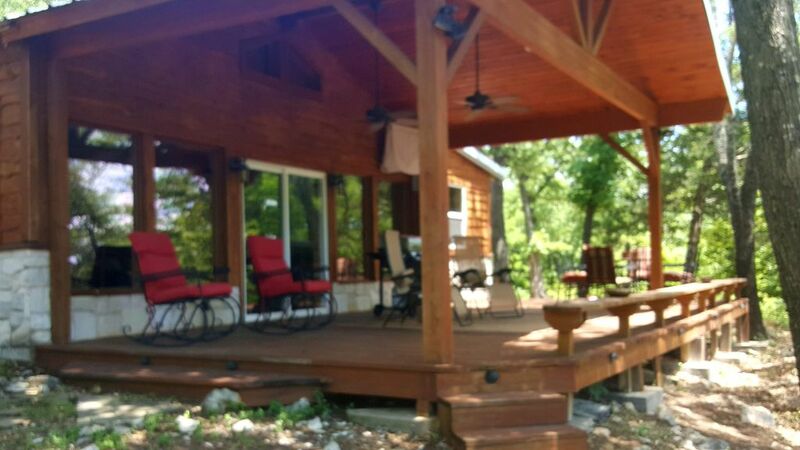 Charming retreat to enjoy water sports on Lake Texoma, entertaining a crowd on the large deck and grounds, or simply for the peace, tranquility, and relaxation of the beautiful setting. 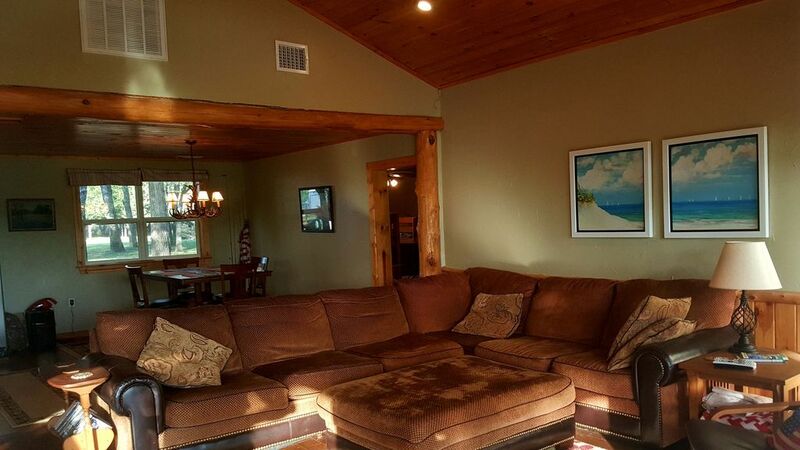 You will fall in love with this charming lake house as soon as you arrive. Its simple design and comfortable furnishings invite you to rest and relax. Vaulted ceilings, stone fireplace and rustic wood interior mirror the natural beauty of majestic oak and cedar trees cascading down the hill to the marina. Read a good book on the oversized sofa or catch up with family and friends on a huge deck overlooking the marina, build a crackling fire in the outdoor fireplace just off the deck for s’mores and ghost stories or play a game around one of two tables in the large, open great room. Don’t worry about a thing. Everything you need is provided, including linens, cookware, a washer and dryer for laundry, indoor and outdoor flat screen TV’s, gas barbecue grill, comfortable beds, stylish furnishings, and plenty of gathering areas for special events or intimate conversation. When you are ready, the area is full of opportunity for adventure! 5 Minutes from large boat ramp at Grandpappy's Marina with complimentary overnight slips. Sail aboard the Compass Rose for a once in a lifetime experience of what life was like aboard a Brigantine in the 1860’s. Weekend At Dock tours 1st Saturdays 10:30-1:30 from Grandpappy Point marina. Enjoy kayaking, hiking, swimming, or search for fossils at Eisenhower State Park. Hagerman Wildlife Refuge is a haven for watching migrating birds and a great spot for wildlife photography, hiking or learning about nature. Choctaw Casino offers gaming, bowling, movie theater, spa and dining. Full service bar and grill at Poppy’s – Grandpappy point marina. Two venues for full service bar and grill at Highport marina. Enjoy Mexican or Italian fare at local Pottsboro restaurants. Town Center shopping in Sherman, just minutes away. Kitchen stocked with pantry items, utensils, cookware, dishes, flatware, stove, refrigerator, coffee maker, microwave, oven, and toaster. Kitchen – stocked with everything you need to prepare ingredients you bring. West facing covered deck overlooking the marina with wrap around bench seating and table for 6. Family friendly, but not kid proof. Guests are responsible for child safety. Our goal is to provide an enjoyable experience in a memorable venue you will want to return to again and again. Our policies are guidelines to ensure an easy, pleasurable stay for all our guests. In addition to the two bedrooms, the cottage is large enough for a few air mattresses or sleeping bags, and the grounds will support a few tents comfortably. The bathroom is small and stylish with all the basic necessities. The Cottage is set on one wooded acre. There is only one other home directly north. The other 3 sides are wooded with several trails and no other homes. Walk the sunset over the marina from the great room, or walk out onto the big deck to enjoy it even more. 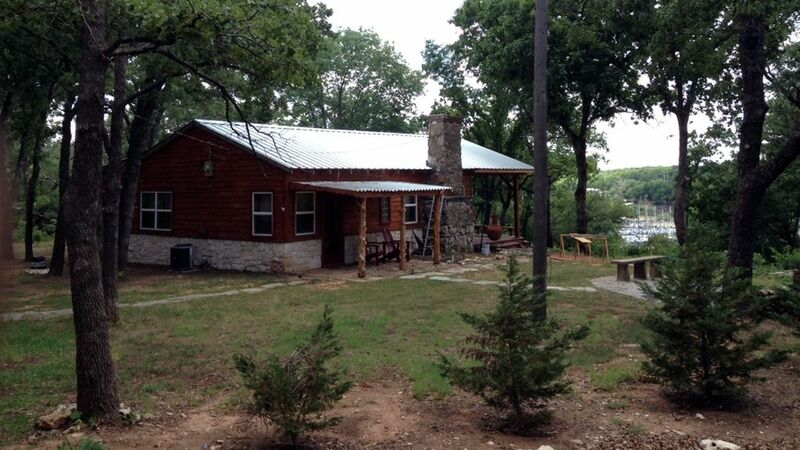 The cottage is nestled among trees and foliage cascading right down into Grandpappy Point Marina on Lake Texoma. Walk down the trail to the lake and swim, fish, or paddle board. The lake shore connects to other trails around the area including the community beach just north of the Cottage. There is a large open bluff area where you can swim, lay in the sun, fish, float or paddle. With the lake at normal levels, there is a sand beach below the bluff. Some tie their boat up overnight. Dining table with four place settings in the dining room, a pub table for 4 in the great room, and an outdoor table for 6 on the deck.